People do some crazy things in Minecraft - like, really crazy - but I think this is the most impressed I've ever been. What you're looking at above is a giant Game Boy running Pokémon Red, built in Minecraft. 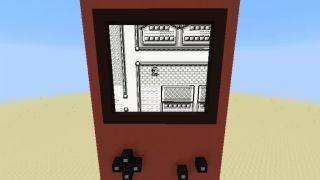 "Great," you say, "Someone modded an emulator into a Minecraft Game Boy. Big deal." WRONG. What you're actually looking at is a 10 x 9 block representation of a Game Boy Color screen, meaning the whole thing is being done natively. The creator, Redditor Magib1m, is using command blocks and a resource pack to remake the Pokémon game in full. It's an incredibly complex project consisting of textures being cloned and frames being shifted. The project's mastermind explains: "All of the background textures are custom maps. In the spawn chunks there is a (very large) physical representation of the entire Pokémon Red overworld, with each block corresponding to a separate map texture. "An armor stand moves along this physical map and, whenever it tries to move (by using inventory slots rebound to arrow keys) the blocks for the newly loaded maps are cloned behind the map display. The item frames loading the new tiles then "read" the block type and display the appropriate map, and the remaining frames get shifted up/down/left/right by a block." Magib1m is even making a Pokédex for the game, gradually turning this into a fully-realised recreation of the beloved Game Boy original. Godspeed, Magib1m. You're an inspiration to us all.